Flowsell is proud to announce that we have achieved ISO Certification in the form of an Integrated Management System. ISO 9001 - Aims to enhance customer satisfaction through the effective application of the system, including processes for continual improvement of the system and the assurance of conformity to customer and applicable statutory and regulatory requirements. This is our statement of continual improvement. 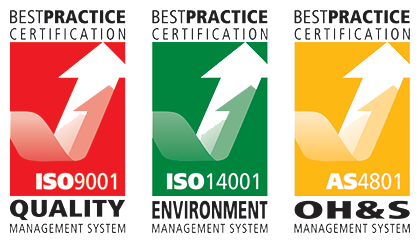 ISO 14001 - Is applicable to an organisation that wishes to establish, implement, maintain and improve an environmental management system, to assure itself of conformity with its stated environmental policy, and to demonstrate conformity with ISO 14001. This is how we can share in making the world a better place for our children. AS 4801 – This is designed to help protect an organisation and its’ employees by implementing an occupational health and safety management system. This is our serious commitment to safeguarding the health and safety of our employees and customers. The quality of our products and the delivery of services is directly related to the satisfaction of our customers. We keep this the cornerstone of our business and strive to build and maintain your confidence in the reliability, suitability and functionality of the entire Flowsell range of products. Flowsell is proud to be an accredited operator working within the International Organisation of Standards (ISO) guidelines and frameworks of product and management standards. Measures and benchmarks of quality are increasingly important for consumers as we live in a progressively globalised business and manufacturing environment. The adherence to such standards provides confidence to customers that our products and business practises are in line with the high expectations of large multinational operations and SME’s alike.